This entry was posted in Blogs, DJs, Music and tagged 2013, Blue Pie, Dance, Dance Music, Danny Avila, DJ Central, Voltage on July 6, 2013 by bppdjcentral. Ultimate Music Experience festival is returning for it’s third year to Schlitterbahn Beach Water Park, South Padre Island, Texas in march 2013. 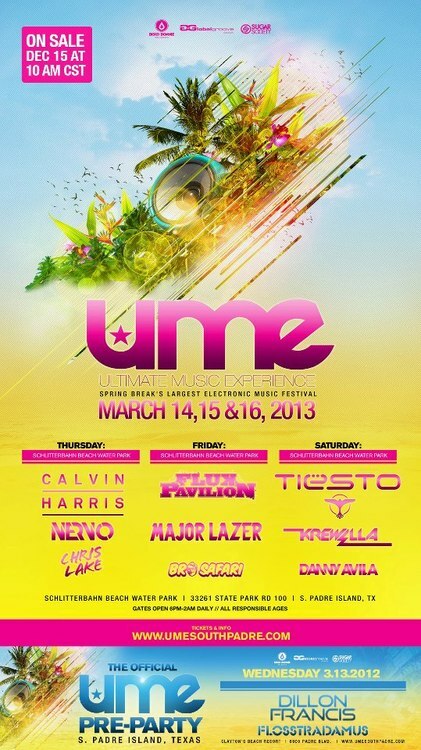 The lineup sports some huge names including Calvin Harris, Nervo, Flux Pavilion, Major Lazer, Krewella and Tiesto. Tickets go on sale December 15 at 10am CST. Don’t miss out on Spring Break’s largest electronic music festival!